From the Batman collection by Entertainment Earth. Batman Tiki Tiki Totem. From the Batman collection by Entertainment Earth. Batman Tiki Tiki Totem. This stackable wooden figure features spectacular 360-degree artwork crafted with hand-painted details and limited decal elements. Tiki totems measure 3 inches tall and are stackable. 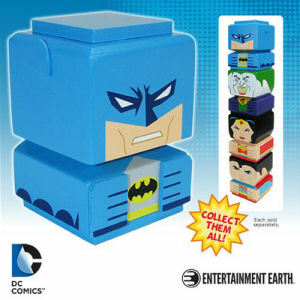 Entertainment Earth Batman Figurines shipping from Canada. No Surprise Border fees or Customs!